Kristin H. Holth is Global Head of Shipping, Offshore & Logistics in DNB. Her previous assignment was Head of DNB Americas from 2007 to 2013. Ms. Holth has worked in various positions within DNB related to shipping and offshore. 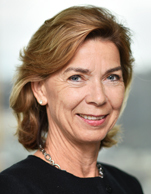 She is presently Board Member of Ocean Industry Forum Oslo, Chairman until 2016. She has held various positions and engagements related to the Norwegian Shipowner Association and Marut. Ms. Holth has her business degree from BI, Oslo, in 1984.